Yesterday, Liuzhou announced the results of its elections for the new city leaders. Chances are you didn’t know there was an election. Few people ever do. The party just vote for themselves. The People’s Republic doesn’t let the People choose! Surprise of the day was the news that we have a “new” Party Secretary taking his place the top of the tree. 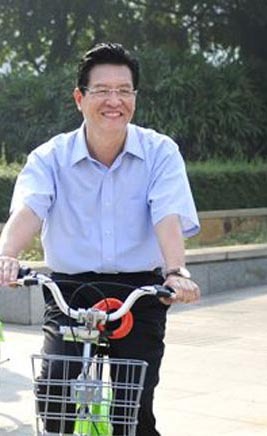 The new secretary is Zheng Junkang (鄭俊康) who replaces Zheng Junkang (鄭俊康) who was first elected Party Secretary in February 2013 after six years as city mayor. No, I haven’t made a mistake. They are the same man. Nothing has changed. But we are being told he is “new”. Other announcements list the names and responsibilities of those appointed to various committee, while adding notes as to which gender and ethnic minority they belong to – unless of course they are male or Han or both. The party secretary and deputy are, of course, Han males. They always are. won’t make a bit of difference to anything. Yesterday Once More.
. This entry was posted on Saturday, August 27th, 2016 at 4:48 pm	and is filed under About Liuzhou, Liuzhou News, Propaganda. You can follow any responses to this entry through the RSS 2.0 feed. Both comments and pings are currently closed.